Thanks, I didn't get the email but the code applied for me. Same here. Thanks for the heads up @Zorak. I got the email, applied the code, and took a Lyft from MSP T2 last night (aka the Humphrey Terminal, home of SWA, Jet Blue and a few others). As usually happens, the Lyft miles posted to my DL account very quickly. But, incorrectly. I only got 3X the dollar spend. 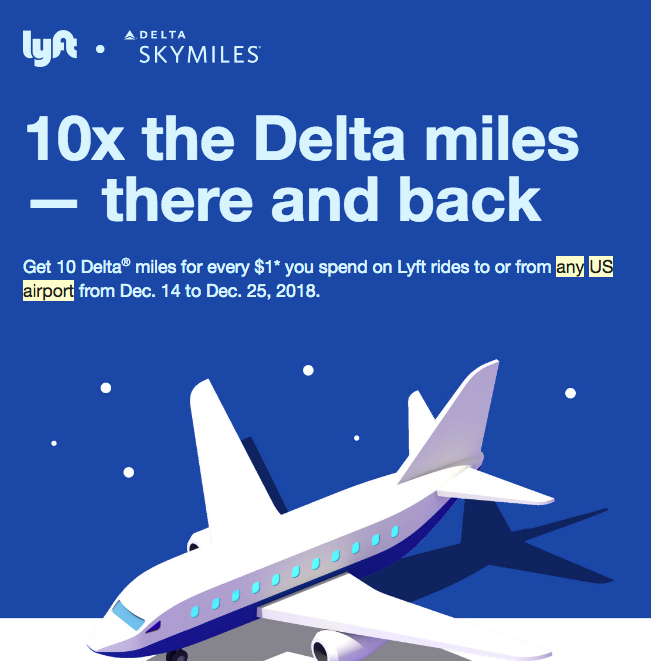 The promotion says "any US airport" for 10X, and while Delta doesn't fly to/from T2, it is most certainly part of MSP. I have contacted Lyft support, and they say I have to wait 5 days to see if the bonus posts. I'm pretty sure it won't - I have had a previous T2 Lyft not ever get the usual 2X bonus but didn't follow up over 30 pesos. I would then need to call in to DL and reference a particular code to try to get my 161 extra miles. I'll do it, mostly on principle, if the miles don't post. If they miraculously do, I'll follow up here. FWIW my ride to SFO yesterday posted correctly. Despite the fixed header saying 2x I did receive 10x on a $30 base fare. I agree that any US airport should mean any US airport. Oh-so-thank-U, Zorak! I just registered & it also promises me 3x points on all other ( = non-airport) rides ! After my Post #124 above, I Googled the bonus & found that it applies only to DL partners from which one has not earned any Skymiles in the past year or so. So I ate at a Rewards Network restaurant (I had been stressing other airlines & hotel co.s,) then transferred 2000 Radisson points into 200 Skymiles, which earned me my 2500 bonus Skymiles permanently! Rode from DCA-home this morning after an AA flight and got the 10x bonus. Was curious whether the 10x would only apply to trips timed to DL flights. Got the email. Took a Lyft from LAX to my office in Irvine. Luckily i received this email in time to apply in the app before my trip to the airport this morning! Thanks! Will surely choose lyft for my ride to the airport tomorrow. I’m reasonably sure that’s exactly the data Delta wants from this promo — how often customers go to the airport and don’t take a Delta flight! Update: Got a 161 mile 'resolution' added to my account today and an email. But the underlying issue seems to persist. I took a Lyft from MSP T2 on Jan 5, and it only credited 1 SM per dollar, not the two is should from the airport. 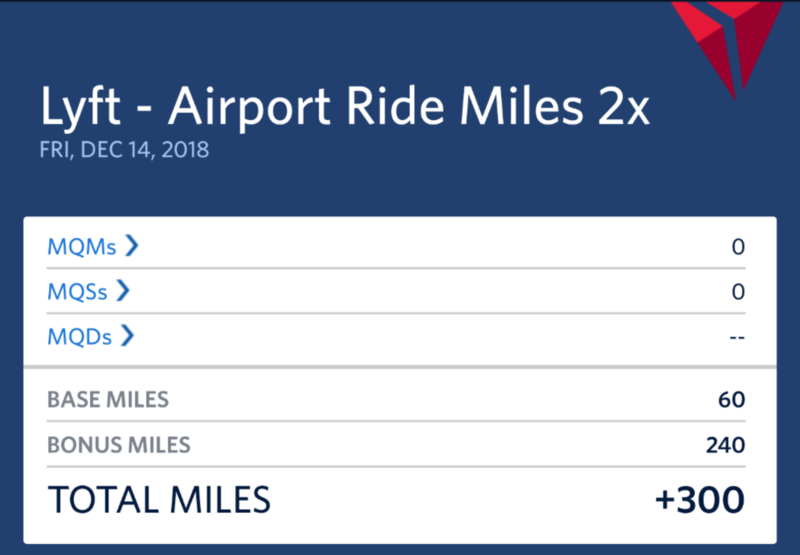 I am not going to pester DL for 23 miles, but it's cheap and slightly petty of them not to acknowledge that in fact T2 is part of one unified MSP airport. I do 90% of my segments and greater than 95% of my BIS miles with Delta. Sure I fly SWA occasionally, but playing games with 25 to 40 miles a ride is silly of them. Very good guess, I spent $164 on Lyft. Perhaps 6am is not really a rush hour from SAN-LAX. And why did Delta gave me 825 miles for that? It shows as a bonus of "5MPD Big Game ATL", no idea what that is. I just got some 10% off rides for a few weeks due to an (allegedly) 5* rating. I've gotten that before but never ridden then. I have a few long Lyfts coming up (DCA> DT Baltimore). 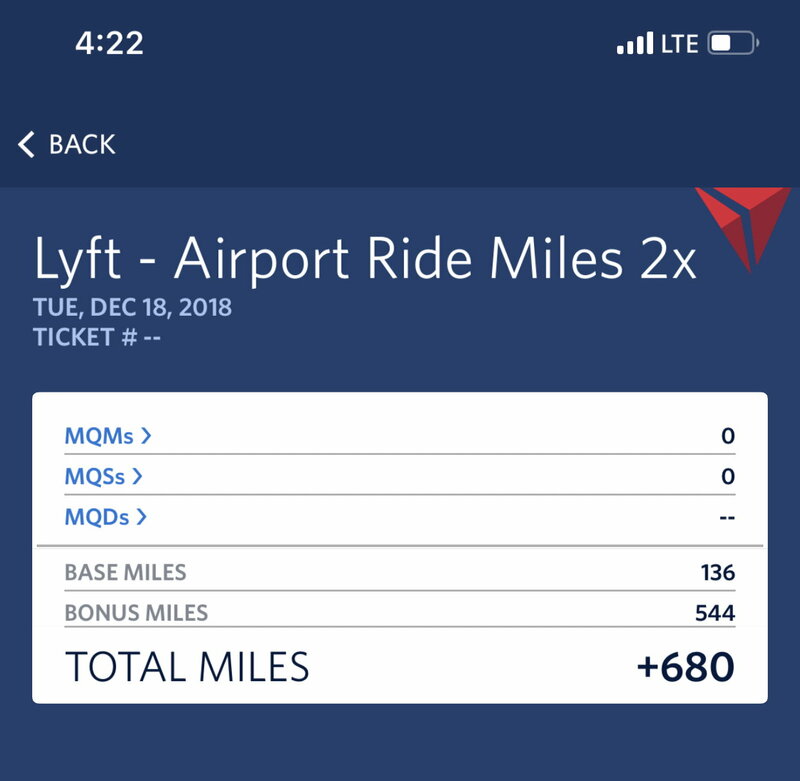 Have you gotten DL miles on discounted Lyfts? Mine was 50% off up to max discount of $6. I received 5x on the discounted price I actually paid, which makes sense. Move was 50% off up to max discount of $6. I received 5x on the discounted price I actually paid, which makes sense. You must be Lyft Titanium!